If you have been spending time researching, trying to figure out which Mac mind mapping software is the right tool for you, you are not alone. With so many options available like online programs, desktop programs and mobile apps, it can be tricky to decide which is the right option for you. Don’t worry, we are here to help. In this Mac mind mapping software review, our team evaluated the leading professional desktop Mac mind mapping software tools to see which are the most useful and if it's worth your money to invest. Although there are some OK free programs available, they lack the functionality that the paid-for-programs offer, so for this evaluation, we chose to evaluate MindManager 11 for Mac, MindView 7 for Mac, and Novamind for Mac. First off, how easy is it to make a mind map, because let’s face it if you can't use the software easily than what’s the point, right? We found that all three Mac mind mapping software tools were fairly easy to work with because they all seem to share Mac OS best practices. Since we are comfortable with other Mac OS software, these tools made us feel right at home. Just like with any software, it takes a few tries to figure out the interface, and what is what, but after we built out a few branches of the mind map, we were up and running in all three tools. With MindManager, it took a little while longer to get our map going, whereas MindView and Novamind were more intuitive. We loved the keyboard shortcuts in all three tools, they really speed things up. In contrast, working with online tools was a very different experience, which was expected since with most online tools, it takes a while to find your bearings. 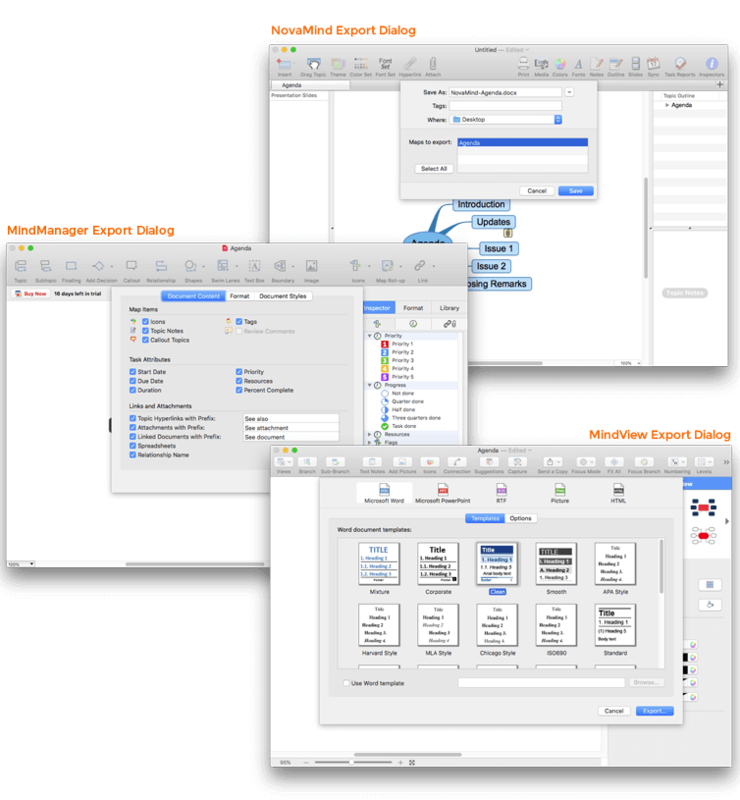 Some Mac mind mapping software tools can be overloaded with features, making their interface seem overwhelming. MindView, however, has solved this problem with a simplified user interface that was packed full of useful features, well organized in a logical and customizable menu structure. In the end, making a mind map in Novamind and MindView was pretty similar, kind of like comparing Ford vs. Chevy. If you like more features and options in your interface, however, MindManager is the choice for you. If you like a simplified user interface, then go with MindView. Let's dig into the features a little deeper. Being able to attach files is very useful in Mac mind mapping software. When attaching files, MindView, MindManager and Novamind were similar and intuitive, but viewing the attachments was what stood out for us. MindView has a quick-click view option that is activated by simply hovering the branch attachment icon and clicking your attachment. MindManager, however, forced us to first open the Inspector, find the attachment and then double-click to view it. A few too many clicks in our opinion… Don’t worry, it wasn’t too difficult to figure out, but we preferred the ease of use in MindView above the other three Mac mind mapping software tools. I hope we still have your attention, because here comes the section that all you Mind Mapping die-hards have been waiting for. Not to worry though, we will keep it brief! In all three applications, you can add images and colors to your mind map, change line colors, branch colors, branch shapes, line thickness, and branch order. Also, all three Mac mind mapping software tools enable you to easily add images, icons, and colors to the branches at any level, not just the main branches, which we found very helpful. So far, we have focused only on mind maps, but not all of us think non-linearly as in a mind map. Some may want to overview data in a linear layout like an outline. And this brings us to the different ways you can communicate data. 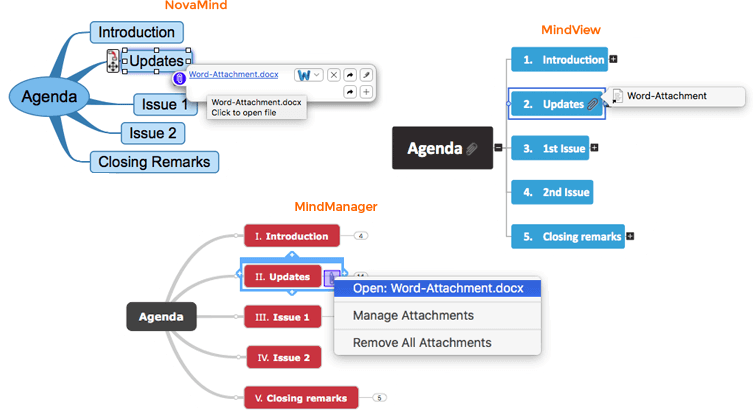 MindView made it very easy to swap back and forth between the various views and had the most options, whereas MindManager and Novamind only offered a mind map and outline view. If you’re wondering about a Gantt or timeline view, sit tight, we discuss these two views later. Since there were plenty of ways to customize the maps in all three Mac mind mapping software programs, and all three were basically the same, let's move on to something more interesting… something that really separated the pack… MS Office integration. When it came to integration, free and online mind mapping tools just couldn’t compete with the desktop applications in this category. What makes the desktop applications true productivity tools is the ability to transfer data out of the mind mapping software without having to re-create the information. So if all desktop mind mapping software is so great, what separates these three Mac mind mapping software applications in this category? MindView and Novamind both had exports to Word, PowerPoint, and for you PM’s out there, MS Project. MindManager was limited to Word only. So what’s the bottom line? MindView had the edge in this category for two reasons. First, MindView uses a template-driven export system, so there is no hassle to the export and the final product is “meeting-ready“. Second, MindView is “bi-directional” meaning you can export to and import from MS Office. We feel that this helped tip the scales in MindView’s favor by making it more of a productivity tool than the others, giving us maximum results with minimal effort. We gave an honorable mention in this section to Novamind. Their exports were much better and more "polished" than MindManager’s and had a few more options in the export wizard. Project management is another category where the online and app options just can't compete. We came to realize that the online tools weren’t mature enough, and the apps couldn’t handle the size of the data. As a result, when referring to mind mapping and project management, desktop software is the only real option. For a beginner project manager who needs an easy-to-use tool to replace the "white board" exercise and move that data to a Gantt chart, MindView is the best choice. Though all three programs let you include task information on the branches, only MindView had a fully functional Gantt Chart view. We actually liked the ease of use of Novamind over MindManager. The one feature that Novamind had that MindManager didn’t was an export to MS Project, but for those that don’t want to use Project, this feature was not really that useful. Once again, we feel MindView has beat out its competition in this category too. If you're a PMP or need an alternative to MS Project, your only choice is MindView. 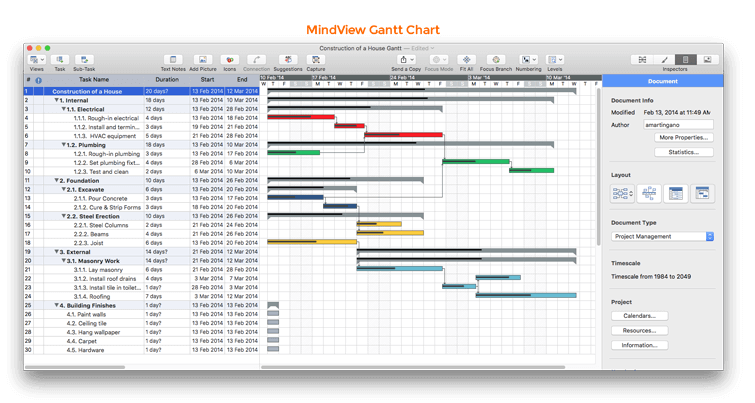 MindView even surprised our project managers with the level of sophistication of its Gantt chart. MindView gave you the ability to create predecessors, select effort-driven tasks, resource calendars and export to Excel or MS Project, just to name a few of its possibilities. Plus their timeline view was pretty sweet, much more robust than Novamind’s. So if you are looking for a serious project management tool, give MindView a try, you won’t be disappointed. If not, have a go with Novamind or MindManager as lighter alternatives. So what is the conclusion of this Mac mind mapping software review, do we have a clear winner? In just making a mind map… not really… We think all 3 are solid options over the alternatives (online, apps and free software). The real takeaway that we discovered during this review is that it's not just about making the mind map. It's more about what you do after you make the mind map. How do you share the data, or manipulate the data without recreating it? In this fast-paced world we live in, it’s all about productivity and time savings. As a result, we found that MindView isn’t just a mind mapping tool, it is a true productivity tool.